When it comes to moving a home or office, we don’t usually think of this as a loving relationship, but maybe it’s time to start! 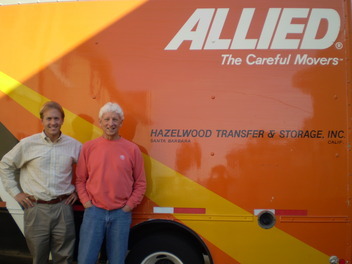 Hazelwood Allied Moving and Storage knows that moving can be a very difficult time for you and your family. Your children may be stressed about their new school, your pets may be acting out, and you are wondering about what will happen to all of your family heirlooms and personal mementos. Do you want to trust your move to a cold, impersonal company or a family-owned business that has been helping customers move for over 41 years? Count on the McCann family to understand what you’re feeling when you move. We’re Santa Barbara’s careful movers, and we treat your possessions as if they were our own. We are one of the oldest family-owned businesses in the Tri-County area, and you don’t achieve that kind of longevity without taking a personal interest in everything your company does. Our impeccable track record is indicative of our commitment to a thorough and careful approach to packing, transportation, and storage. We are proud that our neighbors and friends in Santa Barbara, Montecito, Hope Ranch, Goleta, Santa Ynez, Solvang, San Luis Obispo, Ojai, Ventura, Camarillo, Thousand Oaks and Los Angeles have trusted us to meet their professional moving and storage needs. Rely on Hazelwood to get the job done whether you are relocating to Santa Barbara, moving across town or across the country, or relocating your business. We will perform an in-house survey, assess your moving needs, and provide you with a written cost quotation. If you are relocating a senior citizen, Casey McCann is a Certified Relocation & Transition Specialist. We have every type of moving supply you need to protect your belongings. Our professional drivers will arrive on-time every time. Your furniture is carefully packaged and moved to prevent damage. If there is ever any type of problem, you can call us and talk to a member of the McCann family. If you need to store some of your belongings during the move our McCann Mini Storage has over 400 units ranging in size from 5X6 to 20X20. 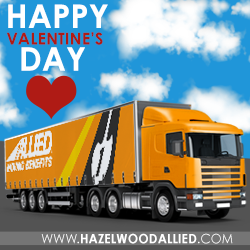 When it comes to your move, we believe you’ll love everything Hazelwood Allied has to offer. Happy Valentine’s Day from the McCann family to yours! About Hazelwood Moving and Storage - Customers refer to Hazelwood Allied Moving and Storage as one of the most professional self-storage and moving companies Santa Barbara has to offer. Santa Barbara businesses and home owners rely on the full-service relocation company to handle everything from family heirlooms to rugged business equipment. Owned by the McCann family for over 41 years, the nationwide movers maintain a commitment to quality and customer service. When using these quality movers Santa Barbara customers can sit back and let Hazelwood carry the load. Visit the website and Facebook page or call 800-541-5958 for more information or to schedule a complimentary move analysis. "moving can be a very difficult time for you and your family. Your children may be stressed about their new school, your pets may be acting out, and you are wondering about what will happen to all of your family heirlooms and personal mementos." With all the emotions and physically heavy work, moving into another place is truly stressful. It's good to know that Santa Barbara's careful movers understand. And what better way to start off your new life in your new home with a moving and storage company that cares? Hazelwood Moving and Storage has been dubbed Santa Barbara's careful movers simply because the team is dedicated to making things as easy on the moving family or business, and treat each item as if it were their own. Family-owned, the company extends personalized and top-quality moving and storage services to lessen the stress of settling into a new neighborhood. Upon request, a complimentary move analysis can be scheduled for businesses and homeowners.